DELBARTON, W. VA. (AP) - The snake that bit Curbs Mounts during a church ceremony was a big one. It lest fang marks an inch apart. Mounts' arm swelled to twice its normal size, but he sought no medical attention before he died three days later. He was a member of a church which follows a Biblical quotation that says "they shall take up serpents . . ."
Mounts, 61, died at his Slickhock home Wednesday, Coroner Ernie Ritchie said. He was bitten twice on the right hand Sunday by a water moccasin. "The right arm was swollen twice the normal size from the hand to the shoulder and was discolored," Ritchie said. "Swelling had even entered into the chest area along with discoloration." The coroner said the fang marks were an inch apart, almost twice the distance of marks from an average bite. Modern efforts to duplicate the miraculous feats of apostolic days are legion. It seems that men cannot or will not learn that the day of miracles has passed. The article above appeared in the Amarillo Daily News on April 21, 1976. 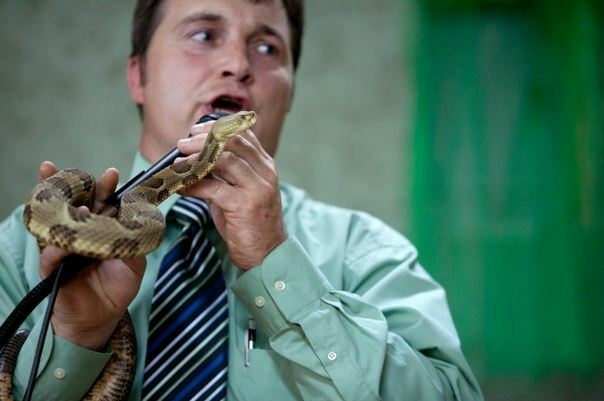 The religious snake-handling cult of Eastern Kentucky and West Virginia has received much publicity. Much of it has been such as is in this little article. It has caused many people to turn from religion as a "form of superstition" with which intelligent people will have nothing to do. However, as there are quack doctors and dishonest lawyers, there are also false religionists. To dismiss religion because of such misguided actions by some is as foolhardy as dismissing doctors and lawyers because some are without integrity. The biblical passage used to justify this snake handling practice is Mark 16:17-18. Here Jesus is issuing His final instructions to His Apostles. "And these signs shall follow them that believe; In my name shall they cast out devils; they shall speak with new tongues; They shall take up serpents; and if they drink any deadly thing, it shall not hurt them; they shall lay hands on the sick, and they shall recover." But, does this passage teach an enduring practice of these miraculous acts? Many say, "Yes." As proof, they cite the tongue speakers of today. Or, what about the Oral Roberts type who heals the sick? However, those who believe these things have been pressed, and rightfully so, to show evidence of the presence within themselves of these other miraculous acts. The more unlearned (which sounds better than "ignorant") have taken up the challenge and started playing with poisonous snakes. Periodically, we read that some poor soul has died, as in this article. When I lived in Louisville, Kentucky, more little articles appeared because we were closer to the scene. Interestingly, I cannot recall a single time when one of the preachers for these people was bitten. Only their disciples. Don't ever call preachers "stupid!" If anyone knows the folly of such teaching, the preachers do! And, they are not about to get caught by a water moccasin with a one-inch fang span. Do you think they are crazy? Like a fox! But they seem to have no compulsions of conscience concerning their brethren. These actions were "signs." Such evidences were necessary in the dawn of Christianity to attract attention to the doctrine. They were to authenticate the message and the messengers. As in Christ's personal ministry spiritual authority was indicated by miraculous works, so was it in the ministry of His Apostles and followers. But, our Lord's words do not mean that they were to be in perpetuity, as a continually recurring evidence of the truth of Christianity. These things were to persuade the unbeliever (I Corinthians 14:22). God confirmed the word of the Apostles. A thing only needs confirmation once! In taking up serpents and drinking deadly things, their lives were preserved by the miraculous power of God, whenever the exertion of such power was needed. What was in itself injurious, was made serviceable to the interests of God's Kingdom. However, the extension of this statement to believers generally, in every age of the church, is not warranted by anything in the text, and such introduces confusion of the sort of our little newspaper article. The promise of Christ was a promise to the Apostles and to the apostolic age. Fulfillment of the promise is all that is demanded by reasonable and responsible men of our age. Was the promise fulfilled? Yes! Paul cast out a devil at Philippi (Acts 16:16-18). The Apostles spoke in other tongues on Pentecost (Acts 2:1-4). Paul was bitten by a venomous serpent at Melita, without harm coming to him (Acts 28:4-6). The sick were healed (Acts 3:6-7). The only act not directly confirmed is the drinking of a "deadly thing." McGarvey and Pendleton wrote: "The book of Acts gives examples of each one of these signs except the fourth, and though we have no record of a disciple escaping the effects of drinking poison, there is little doubt that in the many persecutions such cases did occur" (The Fourfold Gospel, p. 764). How many times must a promise be fulfilled before we acknowledge that the matter is concluded? Yet, men like the snake handler affirm its continuing fulfillment. He who affirms that the signs to yet follow the believers should present some ocular demonstration of the fact before he asks the people to believe his assertion. Let us see them, and then we will believe. Dying from a snake bite does anything but confirm that such continues today. After all, a rank infidel might die from an untreated snake bite. Just exactly when these powers were withdrawn, perhaps we cannot finally decide, i.e., we are unable to give the hour, date, place or person. But, as the purpose of their bestowal was temporary, it is evident that when that purpose was satisfied, and Christianity was launched upon the waters of the world, it was in accordance with divine wisdom that miracles should cease. The Apostle Paul affirmed as much (I Corinthians 13:8). As for me, do not waste your time inviting me to a snake handling service. I would be like that fellow who took his wife to such a service. He was asked if he wanted to "try his faith" by taking up a big rattlesnake. He turned to his wife and asked, "Where is the back door?" She replied, "They don't have one." To which he replied, "I wonder where they would like to have one." Nuff said! Unlike Paul, who happened to be bitten by a snake and suffered no harm (Acts 28:4-6), these people try to put God to the test by purposely picking up snakes and then try to claim that a lack of a bite proves their faith. People in the name of faith refuse to believe God: "Love never fails. But whether there are prophecies, they will fail; whether there are tongues, they will cease; whether there is knowledge, it will vanish away. For we know in part and we prophesy in part. But when that which is perfect has come, then that which is in part will be done away" (I Corinthians 13:8-10).